A video shot by a fellow classmate shows a high school student in California smoking what appears to be weed from a bong made from a Gatorade bottle. 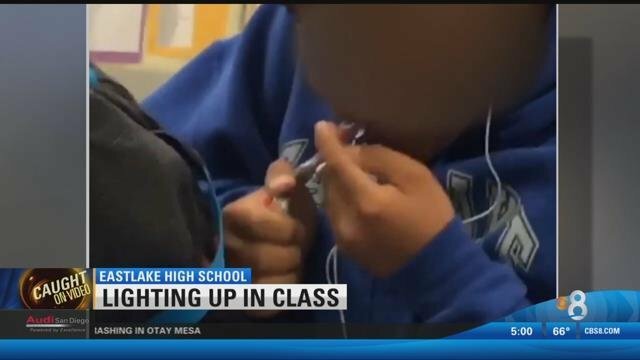 A video shot by a fellow classmate shows a high school student in California smoking what appears to be weed from a bong made from a Gatorade bottle and also a glass pipe, which has seen changes to how classrooms are run in the local area. How does a student lights up pot pipe in a classroom and get away with it? But with everyone recording everything at the swipe of a finger, getting away with such things is harder than ever, but that still doesn’t stop it from happening. There is growing outrage – something that happens with almost any subject, of course, especially in modern times – over a video of a student smoking what appears to be marijuana, in a classroom, from a homemade bong made from a Gatorade bottle and also a glass pipe. Sure, the video only shows a student smoking “something,” but it is rightfully getting people talking. That has seen many people asking – mostly parents, to be sure – how this could go unnoticed. But, obviously, those people are quick to forget about what students could get away with at high school. But, thanks to the video, which was shot by a fellow student at the Eastlake High School in California, it seems changes are coming to stop this happening. An email was sent from the school to parents, which referred to an incident that took place on April 14, but the email did not say specifically what the said incident was.